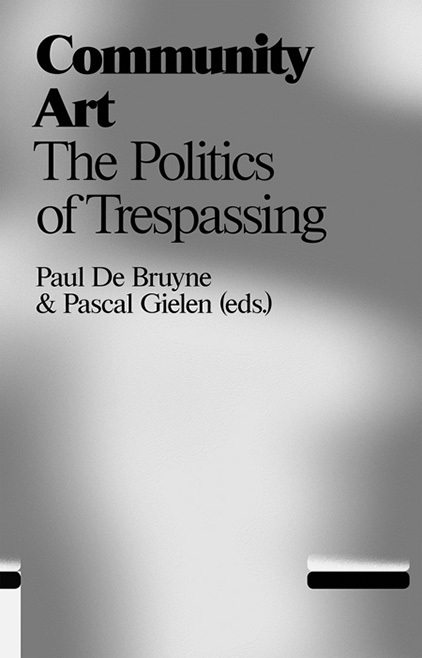 Community Art: The Politics of Trespassing is a collection of essays, interviews and reports compiled by Pascal Gielen and Paul De Bruyne within the framework of the Arts in Society chair at the Fontys School of Fine and Performing Arts, Tilburg. The chair’s research group investigates the relations between societal changes and artistic creation. Gielen and De Bruyne are respectively lecturer and co-lecturer of the chair. As part of their ongoing research, they previously published Being an Artist in Post-Fordist Times (2009). In the introduction to their present book, the editors explain that Community Art is a response to hypothetical questions from the public on the launching of Being an Artist. At that time, they suggested that an acceptance of the results of the present ‘post-Fordist’ era could be seen within community art in particular. On the one hand this was evidenced by the revival of community art and, on the other, by the forms and functions these art practices assume. As such, artists involved in community art projects appear to be cursed with an extremely ‘flexible’ and opportunistic attitude. The complexity of every community art project, Gielen and De Bruyne subsequently propose, is determined by the oscillation between ‘the common’ and the ‘individual’. The first concept was theoretically strongly developed in the 1980s, among others by Paolo Virno, Michael Hardt and Antonio Negri. The individual is embraced both by the art practices occurring since the late nineteenth century and by the market thinking that has arisen during the same time. The editors attempt to clarify the complicated, even paradoxical, position of community art between these two poles by including a multitude of subjective positions and interpretations in addition to more theoretical contributions that expound upon or question the conceptual grounds of community art. The book comprises four sections and an epilogue. ‘Definitions’, with which the book begins, opens with two essays by Gielen and De Bruyne themselves, in which the insights acquired in Being an Artist are further worked out and translated into models for measuring the social or artistic ‘success’ of a community art project. De Bruyne developed the ‘Brown Scale’, with which the level of virtuosity, autonomy or collective nature of a work of art’s production can be charted, among other things. The works of the Brussels music collective met-x, which according to De Bruyne is one of the forerunners of community art, are used to test the model. In ‘Mapping Community Art’, Gielen starts from the idea that all art is relational. Furthermore, he proposes that aesthetics and ethics are antipodal. Although most projects are somewhere between these two poles, art works can be categorized as ‘auto-relational’ (aimed at themselves) or ‘allo-relational’ (aimed at the other). Both extremes include ‘subversive’ and ‘digestive’ projects. In practice, however, the distinction is not always so clear, as can be seen by Gielen’s examples and by the essays in the anthology. In theory, the author gives the term ‘digestive’ to art projects that confirm the dominant prevailing norms, values and customs, and that promote social integration. By way of illustration, he examines Rémy Zaugg’s Le lavoir de Blessey (2007) as a case of ‘digestive auto-relational art’. Zaugg’s work in the hamlet of Blessey in France’s Bourgogne was realized on commission from the mediating agency Les Nouveaux Commanditaires. It came about after a long process of negotiation and compromise. Remarkably, the author subsequently typifies the work as a ‘real Zaugg’, without describing it in artistic terms. Setting aside the question of whether it’s even desirable to measure works of art in statistical terms, or whether Zaugg’s work can be labelled ‘community art’, as Gielen himself endorses, the summary explanation in the artistic sense above all expresses the author’s position: community art must be understood in a social context. And: social relevance and artistic urgency rule one another out. The fact that the explanation of what is still always called a ‘balancing act between ethics and aesthetics’ rests on empirical data, and on previously articulated concepts, becomes clear in the second, third and fourth sections of Community Art. Theatre maker Bart Van Nuffelen, for example, discusses his play De vernissage by the Flemish MartHa!tentatief, based on experiences with drug-using habitués of the Coninckplein in Antwerp. The artistic qualities of De vernissage were no less than the social emancipatory success of the work. In many community art projects, however, this balance is lacking, according to Van Nuffelen. Particularly the considerable subsidies that have been granted to ‘social artistic projects’ in Belgium since the 1990s do harm to artistic quality. Art is all too often instrumentalized, and its critical potential neutralized, by allocating it a place. Prior to this, Gielen and De Bruyne rightly warned against this strategy, which Herbert Marcuse described as ‘repressive tolerance’. During his visit to Alert Bay, a little town lying off the northwest coast of North America, composer and researcher Hein Schoer concludes that it is not always possible to see artistic projects and artistic enterprises separately from a specific culture and its preservation. Half of the 550 residents of Alert Bay are of Caucasian descent, the other half belong to the Namgis tribe. Woodcutting determines the identity of the community and gives it expression. And in a potlatch ceremony, social positions are transferred and claimed through the trade and distribution of handmade goods. Alida Neslo, director of DasArts, experienced that, thanks to the concept of alakondre, a bridge can be built between different peoples and mentalities. The word, originating from the Surinamese language of Sranan, means something like ‘the search for the other, for whatever differs from your own beliefs, your own appearance, your own view of reality’. Her observations are surprisingly similar to those of Antonio Negri in his perspective on ‘the common’. Contra-natural love and solidarity fulfil an important role in this, explains Negri in an interview with Gielen and Sonja Lavaert. Community spirit arises through an encounter between contrary passions and conflict. In the various essays, interviews and reports in Community Art, the art projects bearing that name are particularly understood from the point of view of their social relevance. The book above all makes a contribution to reflection on the communal from an ethical perspective. Although the existence of an aesthetic component in community art projects is recognized, a needed discussion about a possible interpretation of this is almost painstakingly avoided. The only author who defends the aesthetic aspect does so without substantive argument. That is a pity, especially because the projects discussed are nevertheless presented as art. What’s more, the multiplicity and variety of disciplines presented in this compilation prevent the reader from in any way understanding a community art project in its artistic form. The geopolitical dispersion of the projects contributes to this: dance from the usa (Lionel Popkin) and China (Zhang Changcheng), circus from Sweden (Tilde Björfors), video art from Indonesia (Miguel Escobar Varela), to name but a few examples. The question then arises: What is the motivation behind these choices? The compilers of Community Art seem to be saying that in community art projects in particular it is impossible to create a new kind of social involvement by means of aesthetics. Virno’s notion of ‘Dismeasure’, for example, examined in Being an Artist as theoretical support of that possibility, is no longer discussed in this book. This above all makes Community Art. The Politics of Trespassing an endorsement of the statement that Gielen formulated in his own essay: social relevance and artistic urgency rule one another out.